Steven Spielberg Could Have Made Harry Potter, And It Would've Have Been ANIMATED? The LA Times has revealed on it's front page that when Steven Spielberg received the rights to JK Rowling's award winning book, he planned on making it a CGI animated film. of Tintin: Secret of the Unicorn, fans are out raged of what could've happened to the Harry Potter film franchise. But who knows, now that the Harry Potter films are coming to a close, maybe ten years from now we could see and animated Harry Potter movie or television series. "I did think it would be worthwhile for Steven Spielberg to direct. We offered it to him. But one of the notions of Dreamworks’ and Steven’s was, ‘Let’s combine a couple of the books, let’s make it animated,’ and that was because of the [visual effects and] Pixar had demonstrated that animated movies could be extremely successful. Because of the wizardry involved, they were very effects-laden. So I don’t blame them. But I did not want to combine the movies, and I wanted it to be live action." 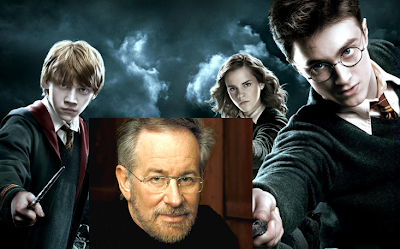 What do you think of what could've been Spielberg's animated Harry Potter film?